The 1950s represented an era of new beginnings. Abstraction dominated the art of the young Federal Republic of Germany. Featuring 74 works by 20 artists, Giersch Museum’s new exhibition is a tribute to the artistic diversity of that decade. Organic and vegetal, rigorously geometrical, impulse and gesture-oriented or tentatively scriptural; bursting with colour, subdued in tone, even monochrome – the abstract art of the period was vastly heterogeneous in terms of form and colour alike. Yet the dissolving boundaries also granted new freedom in the definition of the painting as such and its various genres. 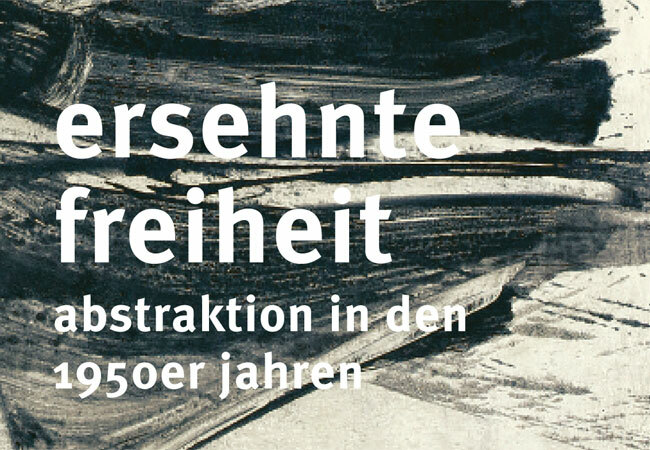 The exhibition at Goethe University’s Giersch Museum starts with the Darmstädter Gespräch (Darmstadt Dialogue) of 1950, which served to take stock of post-war contemporary art and its conflict between figuration and abstraction. The focus is on the most important artists’ groups of the time – “junger westen” in Recklinghausen, “ZEN 49” in Munich and “Quadriga” in Frankfurt – with their wide-ranging origins, venues and protagonists. Works by painters Gerhard Hoehme, Emil Schumacher and Heinrich Siepmann and the sculptor Ernst Hermanns testify to the new paths explored by the “junger westen” (“young west”). Rupprecht Geiger, K. R. H. Sonderborg, Fritz Winter and the sculptress Brigitte Meier-Denninghoff stand for the Munich group “ZEN 49”. The exhibition pays special attention to the painters of the Frankfurt “Quadriga” – K. O. Götz, Otto Greis, Heinz Kreutz and Bernard Schultze: a representative selection of their works from the 1950s sheds light on the four artists’ individual paths. Finally, with examples by Hermann Goepfert, Hans Haacke, Peter Roehr and Franz Erhard Walther, a look at Kassel’s documenta II of 1959 and the emerging generation of artists marks the transition to the 1960s, the age of the “ZERO” movement and object art. Goethe University’s Giersch Museum perceives itself as the “university’s window” on the city of Frankfurt and the Rhine-Main region. For many years, the museum has been dedicated to the research and mediation of regional art – which is unique within Frankfurt’s rich museum landscape. This profile will remain and at the same time a particular aspect will become more important: the museum as a location for exhibitions that show important elements of scientific and intellectual life at Goethe University and which allows suitable topics and exhibits to be presented to a wider audience.